Usage: Congregational use of FAQs does not require permission of The Lutheran Church—Missouri Synod. However, each reproduction should credit the LCMS as the source and include a link or URL to this page. What is the Lutheran view of Baptism and its purpose? How does faith play a role in infant Baptism? What is the history of infant Baptism? What about infants who die before being baptized? Why do Lutherans use the “sprinkle” method for Baptism? Do I have to be re-baptized to join the LCMS? Does the LCMS baptize children of unchurched parents? What if I were baptized in the Worldwide Church of God when they were considered a cult? QUESTION: Can you please clarify the Lutheran view of Baptism and its purpose? Does the child become a Christian when baptized? ANSWER: Lutherans believe that the Bible teaches that a person is saved by God’s grace alone through faith in Jesus Christ alone. The Bible tells us that such “faith comes by hearing” (Rom. 10:17). Jesus Himself commands Baptism and tells us that Baptism is water used together with the Word of God (Matt. 28:19-20). Because of this, we believe that Baptism is one of the miraculous means of grace (another is God’s Word as it is written or spoken), through which God creates and/or strengthens the gift of faith in a person’s heart (see Acts 2:38; Acts 22:16; 1 Peter 3:21; Gal. 3:26-27; Rom. 6:1-4; Col. 2:11-12; 1 Cor. 12.13). Terms the Bible uses to talk about the beginning of faith include “conversion” and “regeneration.” Although we do not claim to understand fully how this happens, we believe that when an infant is baptized God creates faith in the heart of that infant. We believe this because the Bible says that infants can believe (Matt. 18:6) and that new birth (regeneration) happens in Baptism (John 3:5-7; Titus 3:5-6). The infant’s faith cannot yet, of course, be verbally expressed or articulated by the child, yet it is real and present all the same (see e.g., Acts 2:38-39; Luke 1:15; 2 Tim. 3:15). The faith of the infant, like the faith of adults, also needs to be fed and nurtured by God’s Word (Matt. 28:18-20), or it will die. Lutherans do not believe that only those baptized as infants receive faith. Faith can also be created in a person's heart by the power of the Holy Spirit working through God's (written or spoken) Word. Baptism should then soon follow conversion (cf. Acts 8:26-40) for the purpose of confirming and strengthening faith in accordance with God's command and promise. Depending on the situation, therefore, Lutherans baptize people of all ages from infancy to adulthood. The LCMS does not believe that Baptism is ABSOLUTELY necessary for salvation. All true believers in the Old Testament era were saved without baptism. Mark 16:16 implies that it is not the absence of Baptism that condemns a person but the absence of faith, and there are clearly other ways of coming to faith by the power of the Holy Spirit (reading or hearing the Word of God). Still, Baptism dare not be despised or willfully neglected, since it is explicitly commanded by God and has His precious promises attached to it. It is not a mere “ritual” or “symbol,” but a powerful means of grace by which God grants faith and the forgiveness of sins. QUESTION: I believe I understand the LCMS position on Baptism although it seems to lead down a troublesome path. As I understand you can be regenerated through Baptism and also regenerated by believing in Jesus, without Baptism, and then later baptized. The Lutheran position forces one to come to this conclusion of two ways to be saved, although both are by faith alone, just two different means. In Acts 10:44ff they believed and as a result were saved, filled with the Holy Spirit and therefore baptized. Eph. 1:3 also speaks of salvation by the work of the Holy Spirit. If Baptism also saves, it must not save adults since an adult would not say I do not believe but I want to be baptized to get the faith to believe. If indeed the prooftexts of baptismal regeneration do actually refer to salvation, it must only be for babies since adults would of necessity believe before being baptized. And if they do only speak of babies who do not have the capacity to believe, why don't these verses say so. My question then is, what do you see wrong with my reasoning? You do not have to give me the prooftexts since I have known them and have studied them and have ready many articles and the catechism both from Lutherans and others. ANSWER: We are pleased to hear that you have thoroughly studied the Scriptures on the topic of Baptism and other literature dealing with this subject. Perhaps you are very familiar with the Large Catechism's treatment of Baptism, but we mention it here because Luther's treatise on infant baptism in this section is extremely useful. Luther goes to the heart of the foundational theological questions at issue over against errant understandings of Baptism present among those involved in the Anabaptist movement of his time. Perhaps we can make a couple of points that seem pertinent to the issue(s) you have raised. First, as you have implied in your letter, it seems important to note that while Baptism is God's gracious means of conveying to human beings His saving grace revealed to us in Jesus Christ our Savior, it is not the only means. On the basis of the Scriptures we teach that the spoken Word of the Gospel (Rom. 1:16-17; 10:17) and the Lord's Supper (Matt. 26; Mark 14; Luke 22; 1 Cor. 11) are also means of grace. It is no less a miracle of God's grace at work that an adult should believe by hearing the words of the Gospel, than that an infant should receive through Baptism the Spirit who creates the very faith by which one receives incorporation into Christ (Rom. 6:4, “We were buried therefore with him by [Greek: the instrumental dia] baptism...”). Adults who hear the spoken Word and believe eagerly seek to be baptized, not because it is a human rite symbolic of one's commitment or something to that effect, but because of what God promises in and through Baptism. The Scriptures distinguish Baptism and the spoken Word — but do not separate them; they are both means of grace. As you also no doubt are fully aware, we teach that it is not the lack of Baptism that necessarily condemns, but it is the despising of this precious gift that endangers faith, for God Himself has instituted it and attached His promises to it. The Scriptures teach, of course, that there is only one Baptism (Eph. 4:5). There is no indication that God has limited this blessed means of grace to individuals on the basis of age or levels of maturity. Baptism is God’s act, a divine testimony to what “grace alone” really means, whereby He imparts the blessings of forgiveness, life, and salvation to individuals, children and adults alike. And as our Lutheran fathers have always taught, Baptism confirms the grace of God upon adults who have already come to faith, and strengthens them in their faith, even as the Lord’s Supper does. QUESTION: What are the teachings of the Lutheran Church regarding who may be a godparent for a child? Can non-LCMS individuals serve as sponsors? What responsibilities would the godparent be agreeing to? “Sponsors witness that those who receive this sacrament have been properly baptized. They also pray for them and in the case of children, help with their Christian upbringing, especially if they should lose their parents." The Catechism adds: “Only those of the same confession of faith should be sponsors.” One of the reasons for this practice is to avoid putting family members or friends who belong to churches of a different confession in a difficult or compromising situation, in which they would be asked to take vows that they may not be able to carry out in good conscience (given their own religious views and convictions). The LCMS entrusts to individual pastors and congregations the responsibility of making decisions about finding ways to involve such people in the baptismal service (e.g., sometimes they are asked to serve as “witnesses” to the baptism). Since decisions in this regard often depend on the specific circumstances involved, it is best to speak to the pastor himself about such matters. He would also be able to share more specific information about the form of the baptismal service used in his congregation and the precise wording of the vows that sponsors or godparents are asked to take. QUESTION: How does faith play a role in infant Baptism? Is faith later taken care of when the child is confirmed? ANSWER: Lutherans believe that the Bible teaches that a person is saved by God's grace alone through faith alone in Jesus Christ. Baptism, we believe, is one of the miraculous means of grace (together with God's written and spoken Word) through which God creates the gift of faith in a person's heart. Although we do not claim to understand how this happens or how it is possible, we believe (because of what the Bible says about Baptism) that when an infant is baptized God creates faith in the heart of that infant. This faith cannot yet, of course, be expressed or articulated, yet it is real and present all the same (see, e.g., 1 Peter 3:21; Acts 2:38-39; Titus 3:5-6; Matt. 18:6; Luke 1:15; 2 Tim. 3:15; Gal. 3:26-27; Rom. 6:4; Col. 2:11-12; 1 Cor. 12:13). Parents and sponsors of a baptized child bear the responsibility of teaching this child God's Word so that the child's faith may remain alive and grow (Matt. 28:18-20). Confirmation is a time-honored church tradition (not required by God's Word, but we believe useful nonetheless) in which the child baptized as an infant is given the opportunity to confess for himself or herself the faith that he or she was unable to confess as an infant. Faith is not “created” at confirmation, but it is rather confessed for all to hear so that the church can join and rejoice in this public confession, which has its roots in the faith which God Himself created in Baptism. QUESTION: You say that infant baptism is ONE way of salvation. Since this practice was unknown in the New Testament or even the early Catholic Church, it is speculative. The Bible says that repentance is a pre-requisite for faith. I repented at 5, so it can be early, but not in someone's arms. In Romans 6, the Holy Spirit tells us in the Word that in Baptism we have been united with Jesus' death and resurrection–regenerated, dying to sin and rising to new life. That happens to infants when baptized (Gal. 3:27). “For as many of you who have been baptized have put on Christ.” Baptism through the Word creates the faith necessary to receive salvation for infants. Infants can have faith. The Greek word in this text is “paidia” which means babes in arms. Infants can belong to the kingdom of God. “From the lips of children and infants, You have ordained praise ...” Psalm 8:2. “Yet You brought me out of the womb, You made me trust in You even at my mother's breast” Psalm 22:9. From the beginning of New Testament Christianity at Pentecost to our time, unbroken and uninterrupted, the Church has baptized babies. Polycarp (69-155 AD), a disciple of the Apostle John, was baptized as an infant. Cyprian's reply to a bishop who wrote to him regarding the baptism of infants stated: “Should we wait until the 8th day as did the Jews in the circumcision? No, the child should be baptized as soon as it is born." This pattern of baptizing infants remained in Christianity through the Dark and Middle Ages until modern times. In the 1,500 years from the time of Christ to the Protestant Reformation, the only notable church father who expressed opposition to infant Baptism was Tertullian (160-215 AD). Tertullian held that in the case of “little children,” baptism ought to be delayed until they “know how to ask for salvation” (“On Baptism,” ch. 18). Then in the 1520s the Christian Church experienced opposition specifically to infant Baptism under the influence of Thomas Muenzer and other fanatics who opposed both civil and religious authority, original sin and human concupiscence. Thomas' opposition was then embraced by a considerable number of Swiss, German and Dutch Anabaptists. This brought about strong warning and renunciation by the Roman Catholics, Lutherans and Reformed alike. It was considered a shameless affront to what had been practiced in each generation since Christ's command in the Great Commission (Matt. 28:18-20) to baptize all nations irrespective of age. Historical excerpts are from “Infant Baptism in Early Church History," by Dr. Dennis Kastens in Issues Etc. Journal, Spring 1997, Vol. 2, No. 3. QUESTION: What about infants who die before being baptized? There is some basis for the hope that God has a method, not revealed to us, by which He works faith in the children of Christians dying without Baptism (Mark 10:13-16). For children of unbelievers we do not venture to hold out such hope. We are here entering the field of the unsearchable judgments of God” (Rom. 11:33). What is the basis of such hope? It is this, that God is not Himself bound by the means to the use of which He has bound us. That is to say that while Christ has commanded us to baptize all nations, God can save sinners without Baptism. He did so throughout the entire Old Testament. During the first 2,000 years we know of no special means of grace for little children. At the time of Abraham He instituted circumcision, but He did not thereby provide for little girls. It is for God to determine under what conditions He will receive children into His kingdom. A most encouraging instance for the Holy Spirit's power to influence even unborn infants in a spiritual way is found in Luke 1:15, 41, 44, where it is stated that the unborn John the Baptist leaped for joy within his mother's womb when the unborn Jesus was brought into his presence by His mother Mary. Behind all this is the all-encompassing Gospel pronouncement that “God was in Christ, reconciling the world [including the little children] unto Himself” (2 Cor. 5:19). As to the second point we might say: Whether individual Lutheran pastors have ever baptized stillborn children immediately upon their arrival, we do not know, and to our knowledge such practice has never been sanctioned by our church. Nor should it be sanctioned. The means of grace, including Baptism, are for the living only (Heb. 9:27). QUESTION: The LCMS uses the “sprinkle” method of baptism, if you will. The people of the Bible, including Jesus, were baptized using the immersion method. Why doesn't our church follow the way Jesus was baptized by John? ANSWER: On the basis of the evidence provided in the New Testament, it is not possible to prove that the term “baptize” always refers to immersion, nor that the Baptisms mentioned were all done by immersion — implying (in the view of some) that only Baptisms done by immersion can be considered valid. In fact, taken as a whole, the evidence suggests otherwise. In some cases the term "baptize" is synonymous with “wash” (Titus 3:5-6; see also Heb. 9:19; Eph. 5:26, Acts 22:16; and Mark 7:1-4 — a passage in which some earlier translators considered the term “baptize” to include the washing of “dining couches”), and it is highly likely that Baptisms were performed in the early church by methods other than immersion. Three thousand were baptized on Pentecost in Jerusalem, where no river exists and no mention is made of other large quantities of water that would or may have been used. In fact, the shortage of water supplies in general in many parts of the ancient world would have precluded Baptism by immersion. As the Supplementary Volume of The Interpreter's Dictionary of the Bible correctly notes, “It is unlikely that in Jerusalem, Samaria, Damascus, Philippi, Corinth, Rome, or Asia Minor enough water was always available for a full bath” (87). It should be noted that very early in Christian history methods other than immersion were used and allowed. The Didache requires the administrant of Baptism to “pour water three times on the head” (7:3). No mention is made of immersion. Early Christian art depicts Baptisms of persons standing in shallow pools with water poured on the head (see David Scaer, Baptism, 96-101). Lutherans have therefore held that the manner of Baptism (that is, immersion, pouring, sprinkling, etc.) does not determine whether a Baptism is valid, any more than the manner of distributing the Lord's Supper (common cup, individual glasses) affects the validity of this Sacrament. Only the Word of God and the “element” (water), according to divine institution, makes a Baptism valid. QUESTION: My wife and I, who belonged to different denominations, wish to become more permanently and actively involved in one of the local LCMS congregations. However, I have been too shy to ask the pastor if we would need to be re-Baptized in order to be full communicants. ANSWER: The LCMS recognizes and accepts the validity of baptisms properly administered (i.e., using water in any quantity and/or mode, together with the Trinitarian invocation instituted by Christ, Matt. 28:19) in all Christian churches. Assuming, therefore, that you have already received a proper Christian Baptism, there would be no need for you or your wife to be re-baptized, although completion of some form of instruction classes” or “membership classes” is normally required of non-Lutherans who wish to become communicant members of LCMS congregations. Please discuss this with your pastor, who would be happy to discuss this issue with you and to answer any other questions you have about membership. There is no need to be shy — pastors encounter these kinds of questions all the time. QUESTION: Is it appropriate to baptize a baby of parents who do not attend church? What about an infant or a child whose parents have fallen away from the faith? ANSWER: The consent of one or both parents (or guardians) is required in Lutheran practice prior to baptizing an infant. Although addressed to sponsors, the traditional liturgical language — either in a statement to sponsors (in Lutheran Service Book, page 269) or a statement with a question asked of the sponsors (Lutheran Worship, page 200) prior to an infant Baptism — is a sobering reminder that when a child is brought to Baptism his or her parents should understand that (in accordance with Jesus' own mandate in Matthew 28:19-20) Baptism is to be followed by “ongoing instruction and nurture in the Christian faith” (LSB 269). Good pastoral practice prior to Baptism includes a reminder to the parents about the necessity of such ongoing nurture in the faith. If parents request Baptism and do not openly refuse or reject this expectation, Lutherans have typically baptized their child or children. Congregational and pastoral follow-up with parents and encouragement in their responsibility are also vital elements of good practice. Because of such conscientious care in such instances, the Baptism of a child often provides a wonderful occasion for restoring an inactive Christian family to the life of faith or even to bring the Good News of Jesus and His salvation to a family. Parental authority must be respected and a child should not be baptized against the clear objection of parents or guardians. But pastors may face difficult and complex circumstances in which parents are willing to permit Baptism but refuse to commit to ongoing Christian nurture. Of necessity, therefore, pastoral judgment will have to be made in the individual case, since circumstances vary. For this reason, too, lay members of our congregations are urged to speak with their pastor about individual cases where they have a particular request or concern. QUESTION: Why do Lutherans baptize infants? 1.) God's command to baptize (Matt. 28:18-20; Mark 16:16; Acts 2:38). There is not a single passage in Scripture which instructs us not to baptize for reasons of age, race, or gender. On the contrary, the divine commands to baptize in Scripture are all universal in nature. On the basis of these commands, the Christian church has baptized infants from the earliest days of its history. Since those baptized are also to be instructed in the Christian faith, (Matt. 28:20), the church baptizes infants only where there is the assurance that parents or spiritual guardians will nurture the faith of the one baptized through continued teaching of God's Word. 2.) Our need for Baptism (Psalm 51:5; John 3:5-7; Acts 2:38; Rom. 3:23; Rom. 6:3-4). According to the Bible, all people–including infants–are sinful and fall short of the glory of God (Rom. 3:23). King David confesses, “I was brought forth in iniquity, and in sin did my mother conceive me" (Ps. 51:5). Like adults, infants die–sure proof that they too are under the curse of sin and death. According to the Bible, Baptism (somewhat like Old Testament circumcision, administered to 8-day-old-babies – see Col. 2:11-12) is God's gracious way of washing away our sins – even the sins of infants – without any help or cooperation on our part. It is a wonderful gift of a loving and gracious God. 3.) God's promises and power (Acts 2:38; Mark 16:16; Acts 22:16; 1 Peter 3:21; John 3:5-7; Titus 3:5-6; Gal. 3:26-27; Rom. 6:1-4; Col. 2;11-12; Eph. 5:25-26; 1 Cor. 12:13). Those churches which deny Baptism to infants usually do so because they have a wrong understanding of Baptism. They see Baptism as something we do (e.g., a public profession of faith, etc.) rather than seeing it as something that God does for us and in us. Instead, these passages describe Baptism as a gracious and powerful work of God through which He miraculously (though through very “ordinary” means) washes away our sins by applying to us the benefits of Christ's death and resurrection (Acts 2:38-39; Acts 22:16), gives us a new birth in which we “cooperate” just as little as we did in our first birth (John 3:5-7), clothes us in Christ's righteousness (Gal. 3:26-27), gives us the Holy Spirit (Titus 3:5-6), saves us (1 Peter 3:21), buries us and raises us up with Christ as new creatures (Rom. 6:4; Col. 2:11-12), makes us holy in God's sight (Eph. 5: 25-26) and incorporates us into the body of Christ (1 Cor. 12:13). All of this, according to the Bible, happens in Baptism, and all of it is God's doing, not ours. The promises and power of Baptism are extended to all in Scripture — including infants — and are available to all. Parents and sponsors then have the privilege and responsibility of nurturing the baptized child in God's love and in His Word so that he or she may know and continue to enjoy the wonderful blessings of Baptism throughout his or her life. QUESTION: If one was baptized years ago in the Worldwide Church of God (when they were considered a cult) and would like to join the Missouri Synod, is it necessary to be re-baptized? ANSWER: Our LCMS theologians have taken the position on the basis of the Scriptures that the Baptisms of non-trinitarian or anti-trinitarians are not valid Baptisms. While they may use a Trinitarian formula in their rite, they in fact deny the Trinity. In such cases, therefore, God’s Word is not being added to the water, but rather a man-devised caricature of the words of Christ. Since such is the case with the former Worldwide Church of God, it would be necessary for one to be re-baptized. Will God forgive me if I haven’t forgiven others? Could you help me to understand repentance? How does a person know if he or she has sinned against the Holy Spirit? QUESTION: Why do bad things happen to good people? Does God cause bad things or does he just let them happen? Does he punish or discipline? And what could be the purpose —such as when you lose your Mom at the age of 11 and she suffered so with cancer? ANSWER: We live in a world permeated with sin. It's a sinful world. Because of that and since the devil is the prince of this world, as the Bible says, bad things happen to good people. But consider this. A lot more good has happened to people who love God in Jesus than bad. Read Psalm 90 and 91. And consider how God can turn the bad things into good for those who love God (Romans 8:28). God does no evil. Yes, He can cause and allow bad things to come to us, but always for our good. Scripture also gives witness to God punishing the wicked (Proverbs) and punishing individuals and even whole nations for evil (Egyptians, Israel for their wickedness and idolatry, etc.). But when it comes to sin, we Christians know that God has punished Jesus in our place for our sins, and that we are not punished. God disciplines those whom He loves. Read Hebrews 12. We know God is Good and Gracious and Loving in giving us the Way, the Truth and the Life for our salvation, our Savior Jesus. We know that He works all things for our good. And that must be the purpose in your and your mother's case, although it may be a bitter pill to swallow. We must always turn to God in His Word and prayer for answers, never away from Him. Sometimes the answers He has are not evident right now, but later. It may even be in heaven that we see and understand His purposes. QUESTION: Will God forgive me of my sins if I haven't forgiven others? ANSWER: The question you have raised often arises in connection with the words spoken by Jesus in the context of the Lord's Prayer (Matt. 6:14), "If you forgive men their trespasses, your heavenly Father will forgive you; but if you do not forgive men their trespasses, neither will your Father forgive your trespasses." In view of Scripture's wider teaching concerning forgiveness, it seems proper to understand Jesus' point in Matt. 6:14 to be that the stubborn, persistent refusal to forgive others is evidence of a blinded and hardened heart which lacks a real understanding of and faith in God's forgiveness in Christ. What Jesus is doing here, therefore, is issuing a strong warning to us to "search our hearts" to see if we really understand and accept the Gospel and its practical implications for our lives. If we say, "I want God to forgive me, but I refuse to forgive those who sin against me," we really don't know what "forgiveness" and "faith in Jesus" are all about. We cannot expect God to "forgive" us if the attitude of our heart reveals that we have no real understanding of or faith in his undeserved grace in Christ Jesus. Anyone who truly understands the true nature God's grace and forgiveness in Christ and puts his or her trust in that forgiveness will desire and seek to extend that forgiveness to others. God's forgiveness is not a "reward" for our forgiving others, but once we receive it in true faith and gratitude it is impossible not to want to share it with others. QUESTION: I don't really understand repentance. Is it being sorry for your sins and confessing them to God, or does it mean to stop committing a certain sin? Like if you are stealing, does repentance mean to stop stealing because that would mean we can stop sinning, and we know we can never stop sinning. I have sins that I commit over and over again, not like I did before I was saved, but I still commit them. So if I don't stop committing those sins (repentance), does that mean that I am going to hell? And also, when the Bible talks about how worldly sorrow brings death but godly sorrow brings repentance and life, how do I know which one I have? ANSWER: Repentance means first of all, to acknowledge our sins, to be truly sorry for them. This "godly sorrow" comes from the Holy Spirit convicting us with God's law. But the Bible also uses the work of repentance in a broader sense to include faith in Jesus our Savior. This faith is produced by the Holy Spirit, who convinces us through the Gospel that our sins are forgiven for the sake of Jesus, who lived, died and rose again for us. According to the Bible, those who are truly sorry for their sins and trust in Jesus as their Savior also want to turn away from their sins, intending with the help of the Holy Spirit not to keep on living a life of sin. If we want to keep on sinning, we need to ask ourselves if we have really repented. However, we are weak human beings and although we do not want to commit the same sins again and again, we may sometimes fall into sin out of weakness. Whenever we sin, we know (as John says) that "if we confess our sins, [God] is faithful and just and will forgive our sins" for the sake of Jesus our Savior (1 John 1:9). If repentance becomes a "game" with God, if we don't really want or intend to stop committing a certain sin (say stealing), and if we go on stealing and living always in that sin of stealing, then we place ourselves in grave spiritual danger. We need to ask that God the Holy Spirit give us the power to stop committing that sin and trust Him to help us fight against it. Sad to say, the desire to sin may come back at times, for which we will have to repent again. That's not the same as living in sin. We all commit all kinds of sins daily, for which we have to daily repent. As long as we are sorry for our sins and believe that God forgives our sins for Christ's sake, we will be forgiven and have eternal life. Worldly sorrow is the kind of sorrow Judas Iscariot had, which caused him to commit suicide. It was a self-centered remorse and despair that wrongly concluded that all was lost in this life, that there was no hope, that there was nothing God could do. Second Corinthians 7:10 says that this kind of sorrow brings death. But godly sorrow is true sorrow over sin accompanied by trust in Jesus for forgiveness. This is the kind of sorrow Peter had after he denied Jesus, and it is the sorrow King David had after he committed adultery and murder (Psalm 51). Godly sorrow leads to life and salvation because it includes faith in Jesus Christ. QUESTION: How does a person know if he or she has sinned against the Holy Spirit? Could a person commit this sin and not know about it? Is concern about this sin evidence that one has not committed it? ANSWER: Presumably you are referring to the warning of Jesus against the sin against the Holy Spirit in Matthew 12:31-37 (paralleled in Mark 3:28-30; Luke 12:12). This warning follows the Pharisees’ accusation that Jesus was in collusion with Satan upon hearing of Jesus’ healing of the dumb demoniac (Matt. 12:22-30; cf. parallels in Mark and Luke). In all three Gospel accounts the term “blaspheme” is used to describe this sin against the Holy Spirit. It should be noted that Jesus does not say that the Pharisees had actually themselves committed this sin, but that they were in danger of doing so. The sin against the Holy Spirit is the conscious, persistent, stubborn, unyielding refusal of someone who was at one time a believer to acknowledge his or her sin, be sorry for it, and desire God's forgiveness in Christ. It is impossible, therefore, for a confessing Christian to fall into this state unknowingly or unwillingly, and any confessing Christian who is sincerely concerned about the possibility of having committed this "sin" clearly has not committed it, because one of the necessary signs of being in this state of non-repentance and unbelief is having no real concern or remorse about being in this condition. What happens to people who have not heard the Gospel? What’s the LCMS view on the Left Behind series? Are there degrees or levels in heaven or hell? Does the LCMS believe in the rapture? Are my family members with God, or are they asleep until the end of the world? QUESTION: I recently attended a Bible study in which we discussed the fate of those who never had the chance to hear about God. What happens to such people? Christ, the Savior of the world, answered the first question in this way: "He that believeth and is baptized shall be saved; but he that believeth not shall be damned" (Mark 16:16). The apostle Peter put it another way: "Neither is there salvation in any other; for there is none other name under heaven given among men whereby we must be saved" (Acts 4:12). The same truth is expressed in John 3:16 and 18:36; Rom. 2:12; Eph. 2:11-13. Though such people have not heard the Gospel, they are without excuse (Rom. 1:19-23 and 2:12). God has not left Himself without witness (Acts 14:17), but He has revealed His existence by the works of nature and wants men to seek Him, if "haply they might feel after Him and find Him" (Acts 17:27). The Bible also reveals that people who knowingly and willfully reject the Gospel of Jesus will be more severely punished than those who never heard it (Luke 12:47, 48). Because of the horrible doom awaiting all those who do not believe in Jesus, we should seek to reach as many as possible with our own fearless witness and ardently support the missionary endeavors of our church on behalf of those whom we cannot reach with our own voice. Nor must we forget our responsibility toward fellow Christians who are on the verge of erring from the truth, whether by word or deed (Gal. 6:1; James 5:19, 20). And lest we should preach to others, but ourselves become castaways, we should be earnestly concerned about our own salvation (Matt. 26:41; 1 Cor. 10:12; Phil. 2:12). QUESTION: Recently many people have been reading the Left Behind series of books by Tim LaHaye and Jerry Jenkins. While these are fiction books, they discuss the "end times" within a biblical context. What is the LCMS position on these books and their portrayal of the end times? ANSWER: The conceptual framework for the Left Behind series is the so-called "rapture," which is a central aspect of dispensational pre-millennial views of the end times. Such views conflict with the Lutheran position on what the Scriptures and the Lutheran confessional writings teach concerning the coming of Christ and the end of the world. To assist readers in their evaluation of the Left Behind series, we recommend they consult the 1989 report of the Commission on Theology and Church Relations titled, The End Times: A Study of Eschatology and Millennialism. Included in this report is a discussion of current views of "the rapture" and helpful charts summarizing them. You also may wish to read an article that appeared in the March 2001 issue of The Lutheran Witness titled, "Will You Be Left Behind?" QUESTION: In our Bible study today, we discussed if there are degrees or levels in heaven and hell. It was also suggested that hell is not eternal. Are there scriptural references to support these points? "In both "body and soul" unbelievers will suffer eternal separation and condemnation in hell (Matt. 18:8 and 25:46; Mark 9:43; John 3:36; 2 Thess. 1:9; Jude 13; Rev. 14:11). Indescribable torment will be experienced consciously, the degree determined by the nature of the sins to be punished (Matt. 11:20-24 and 23:15; Luke 12:47-48)." Regarding heaven and "degrees of glory" the Commission says: "Eternal life is pictured in the Scriptures as a state of never-ending "blessedness." This means, on the one hand, that Christians will live forever in perfect freedom from sin, death, and every evil (Is. 25:8; 49:10; 1 Cor. 15:26, 55-57; Rev. 2:7, 11, 20:14 and 21:4). At the same time, they will experience the unending joy of being with God in the new heavens and new earth (e.g., Rev. 21-22; Ps. 16:11). Forever eliminated is the possibility of falling away from God. This blessedness will bring with it the joy of being in eternal communion with fellow believers, whom we have reason to believe we shall recognize (cf. Matt. 17:3). And, there will be no limitations or degrees attached to the enjoyment of the happiness to be experienced, though there will be degrees of glory corresponding to differences of work and fidelity here on earth, producing praise to God but no envy (see 2 Cor. 9:6; Matt. 20:23)." QUESTION: Does The Lutheran Church—Missouri Synod believe in the rapture? ANSWER: The answer to your question depends on what you mean by "the rapture." The English word "rapture" is derived from the Latin translation of the verb "caught up" in 1 Thess. 4:17 (rapiemur). Lutherans certainly believe what Paul teaches in this passage, namely, that those who are still living on earth when Christ returns visibly on the last day "will be caught up" ("raptured") together with "the dead in Christ" to "meet the Lord in the air." Some Christians teach, however, that the "rapture" will take place not on the last day but in connection with an "invisible" coming of Christ occurring before a seven-year period of "tribulation" on earth, allowing Christians to "escape" this tribulation and then later return to earth for a literal "1,000 year reign of Christ." Lutherans do not believe that these teachings are based on a proper understanding of Scripture. Scripture teaches that all Christians will endure varying degrees of "tribulation" until the last day, that Christ will return only once (visibly) to "catch up" ("rapture") all believers, living and dead, into heaven, and that all believers will reign forever with him in heaven. Lutherans understand the "1,000 years" of Rev. 20:11-15 to be a figurative reference to Christ's reign here and now in the hearts and lives of believers, which will culminate in our reigning with Christ forever in heaven following his return on the last day. For more information, you may want to read the Synod's theological commission report titled The End Times: A Study of Eschatology and Millennialism. QUESTION: Can you sin in heaven? My first thought is that one cannot. But then I wonder if God takes away our free will when we get to heaven? I can't imagine why we would want to sin in heaven — we'll be perfect and the place we are will be perfect. But then I think of Adam and Eve before the fall — they were perfect, made in God's image, and they lived in a perfect place. Yet they had free will and sinned. ANSWER: Your first thought, from your knowledge of the Bible, is correct beyond all doubt. There is no sin in heaven, because it is the place where the sinless God dwells. Those who have been cleansed in the blood of the Lamb have been cleansed forever. There is no more death in heaven, the result of sin. We die once and then the judgment. Our death ends sin, the Scripture says. Just as the good angels are fixed in their sinless state now, so also we shall be. We will serve God forever willingly, but it will be impossible for us to will to sin as did our first parents. In heaven it will not be like in the beginning of our human history. Old things have passed away, the new has come (Rev. 21:4). There will be only life, eternal life, and where there is eternal life there is eternal sinlessness. Rest your soul on that and praise God for His great goodness in giving us a sinless Savior. QUESTION: What happens when we die? Are we judged immediately and our soul sent to Heaven or Hell or what? ANSWER: Lutherans believe that Scripture teaches that at the moment of death the souls of believers enter the joy of heaven (Luke 23:43; Acts 7:59; Rev. 14:13; Phil. 1:23-24), while the souls of unbelievers at death are consigned to "the prison" of everlasting judgment in hell (1 Peter 3:19-20; Acts 1:25). The departed souls remain in heaven or hell until the Day of Judgment, when they shall be reunited with their own bodies (Matt. 10:28; John 5:28-29; John 11:24; Job 19:26). Therefore, "The Last Judgment is the grand finale of this present world, in which the sentence pronounced in death over the individual will be publicly confirmed and extended to the body, which till then has returned to the dust, from whence it came. He who continues in the faith unto the end has nothing to fear for his soul after death or for his body and soul on the Day of Judgment (Rev. 2:10; 14:13)" (Edward Koehler, A Summary of Christian Doctrine, St. Louis: Concordia, 1939). You may also want to read the following FAQ, "Asleep Until the End of the World." QUESTION: Recently, both my sister and father have died (separately). While I truly believe that Jesus died for our sins, those who accept Him as their personal Savior, I have been troubled as to where my sister and father are now. Are they asleep until the end of the world? Are their bodies asleep, but their souls with God? Or, are they in Heaven with God now? In the moment of death the souls of the believers enter the joy of heaven. Jesus said to the malefactor: "Today shalt thou be with Me in paradise" (Luke 23:43). Stephen said in the hour of death: "Lord Jesus, receive my spirit" (Acts 7:59). Whoever dies in the Lord is blessed "from henceforth" (Rev. 14:13). Paul desires "to be with Christ," and adds that this is "far better" for him than to continue in the flesh (Phil. 1:23-24). For this reason we pray that finally, when our last hour has come, God would grant us a blessed end and graciously take us from this vale of tears to Himself in heaven. On the day of the final judgment, the redeemed souls in heaven will be reunited with their own (now glorified) bodies and will begin to enjoy the bliss of heaven in both body and soul (John 5:28-29; Phil. 3:20-21; 1 Cor. 15). The Lutheran church has always rejected as unscriptural the idea that the soul "sleeps" between death and Judgment Day in such a way that it is not conscious of heavenly bliss. Will our souls be with God when we die? On what should we base our assurance of salvation? If God already predetermined who was saved, what is the point of witnessing? If we do good, will we be saved? Do believers have eternal assurance? Could you help me to understand faith and good works? What does the LCMS believe regarding man's freedom of will? If a Christian is already saved, should he/she do good works? Do we have to try to amend our life in order to be saved? Would you explain "predestined" in Romans 8 and Ephesians 1? In the moment of death the souls of the believers enter the joy of heaven. Jesus said to the malefactor: “Today shalt thou be with Me in paradise” (Luke 23:43). Stephen said in the hour of death: “Lord Jesus, receive my spirit” (Acts 7:59). Whoever dies in the Lord is blessed “from henceforth” (Rev. 14:13). Paul desires “to be with Christ,” and adds that this is “far better” for him than to continue in the flesh (Phil. 1:23. 24). For this reason we pray that finally, when our last hour has come, God would grant us a blessed end, and graciously take us from this vale of tears to Himself in heaven. On the day of the final judgment, the redeemed souls in heaven will be reunited with their own (now glorified) bodies, and will begin to enjoy the bliss of heaven in both body and soul (John 5:28-29; Phil. 3:20-21; 1 Cor. 15). The Lutheran church has always rejected as unscriptural the idea that the soul “sleeps” between death and Judgment Day in such a way that it is not conscious of heavenly bliss. QUESTION: On what should we base our assurance of salvation? I know the Word and the promises of the Gospel are our rock, but how do we distinguish between real faith and mere intellectual assent? But in the face of emotional ups and downs, moral failings, intellectual doubts, and confusion over doctrine, how can one know if one truly has faith in Christ? ANSWER: Lutherans believe that faith is created and strengthened not by looking inside of one's self (to one's own faith and/or doubts) but by looking outside of one's self (to God's Word and promises in Christ). Therefore, assurance of salvation is to be sought by looking to God's Word and promises in Christ (which create and strengthen the faith through which one is saved), not by looking inward at the strength or weakness of one's own faith (which creates either pride and false assurance or doubt and lack of assurance). Anxiety regarding doubts, strength of faith and certainty of salvation are signs of faith (however weak it may be), not signs of unbelief, since the unbeliever has no concern or anxiety about doubts, faith or salvation. If you would like to study this issue further, I would recommend Martin Chemnitz's book on Justification, available from Concordia Publishing House (800-325-3040, stock no. 15-2186). QUESTION: How does the church feel about the theological tension between the universal offer of salvation (Matt. 11:28, John 3:16, John 6:40) and divine election (John 15:16, Eph. 1:4, Acts 13:48)? If God already predetermined who was saved, what is the point of witnessing? ANSWER: Let me first of all refer you to a couple of resources that set forth the position of the Synod on Election and objective or "universal" justification. The doctrine of Election is summarized in the Synod's A Brief Statement of the Doctrinal Position of the Missouri Synod. You may also find helpful the Commission on Theology and Church Relation's 1983 Theses on Justification (see esp. section VI The Universal and Finished Results of Christ's Work of Obedience). From the standpoint of human reason, the scriptural teachings that God has objectively justified (objective justification) the whole world through the redemptive work of Jesus Christ and wants all people to be saved through faith in Him (subjective justification), and that He elected by grace from eternity those who are saved, cannot be resolved. We must say with Paul when he contemplates the mystery of our election, "Oh, the depth of the riches and wisdom and knowledge of God! How unsearchable are his judgments and how inscrutable his ways!" And yet, we can say this on the basis of God's Word. By faith we hold that it is precisely because we Christians are God's elect that we proclaim the good news of salvation. We see this in Ephesians, where Paul begins by praising God for His election (the purest of Gospel and only meant for our comfort; Eph. 1:3-10), while at the same time and in the same breath declaring "Of this Gospel I was made a minister according to the gift of God's grace, which was given me by the working of his power. To me, though I am the very least of all the saints, this grace was given, to preach to the Gentiles the unsearchable riches of Christ ..." (Eph. 3:7-8). This same Apostle, who regarded himself as among God's elect, wrote to the Corinthians, "For necessity is laid upon me. Woe to me if I do not preach the Gospel!" (1 Cor. 9:16). We witness, therefore, because God commands us to make known His saving will to others and because we are in fact part of God's elective plan being carried out in history (Eph. 3). QUESTION: Near the end of the Athanasian Creed, it says "that if you do good" you will be saved. How does this relate to being saved by grace? ANSWER: The statements of the Creed read as follows: "At whose coming all men will rise again with their bodies and will give an account of their own works. And they that have done good will go into life everlasting; and they that have done evil, into everlasting fire." It is important to note that the Athanasian Creed does not here say that certain people will "enter eternal life" because they "have done good." It says that "those who have done good" (and only those who believe in Jesus alone for salvation are able to "do good" in God's sight) "will enter eternal life." On Judgment Day, God will point to our good works not as the cause of our salvation but as the evidence of the faith through which we have been saved and which enabled us to do that which was well-pleasing in his sight. There are numerous Bible passages that make the same point and use the same language (e.g., Matt. 25:31-46, Rom. 2:6-10, James 2:14-16). The confession of these sentences in the Athanasian Creed in our churches is, in fact, a helpful reminder of the relation of faith and good works as taught in the Bible. "Paul is not contradicting his continual emphasis in all his writings, including Romans, that a person is saved not by what he does, but by faith in what Christ does for him. Rather, he is discussing the principle of judgment according to deeds. Judgment will be rendered according to one's deeds in the sense that the good works of the believer give evidence that he has faith. Good works, which are seen, give evidence of faith, which is unseen." QUESTION: One of your FAQ answers states that it is possible for one to lose his salvation. However, in your Theses on Justification (1983) on this website it says plainly that believers have eternal assurance (paragraph 58). Which is it? ANSWER: Lutherans believe both are true and Scriptural: It is possible for a believer to fall from faith and lose salvation, and it is possible for a believer to have complete assurance of eternal salvation through faith in Jesus Christ. If this seems paradoxical to human reason, then (Lutherans say) this is only because the teaching of Scripture itself on this issue (as on many other issues) appears paradoxical to human reason. For Lutherans, this is essentially a matter of properly distinguishing between Law and Gospel: Warnings against falling from faith are the strongest form of God's Law, intended to warn against "carnal security" based on "good works" or against the attitude that "since I'm saved, I can do anything I want to do." Assurances of God's constant and eternal love in Christ are the sweetest and purest form of Gospel, intended to comfort those who are plagued by their sins and by their failures to keep God's Law perfectly. QUESTION: I am having some trouble coming to understanding of faith alone based off of the Scripture that was cited on your website, and I was hoping for further explanation regarding the seemingly conflicting messages. I think for me what is most problematic is actually Romans 2 — not listed as a reference but essential in understanding fully Romans 3 and 4. Romans 2 is based on the idea that to be truly Jewish is to be inwardly circumcised and not outwardly circumcised and inwardly something else. Then given Romans 3 and 4, is this necessarily an attack on good works as being a means for salvation or is this an attack on professing to be one thing and actually being another? I was just wondering because of the obvious stark contrast to James 2:14-26. ANSWER: The key question you seem to be asking is this: Is what Paul says in Romans 3 (e.g., v. 28 "...we hold that a man is justified by faith apart from the works of law") "an attack on good works as being a means for salvation?" As you no doubt are aware, the central and consistent teaching of Paul that we are justified by grace alone through faith alone on account of Christ is nowhere more beautifully summarized than in Eph. 2:8-9: "For by grace you have been saved through faith; and this is not your own doing, it is the gift of God — not because of works ..."
By its very definition "grace" means that human works do not contribute in any way to a person's salvation or justification, as St. Paul says in Rom. 11:6, "But if it is by grace, it is no longer on the basis of works; otherwise grace would no longer be grace." Or as the apostle had already said in 3:28, "...a man is justified by faith apart from [Greek: choris] works of law." Paul said this, of course, in the context of Jewish opinions regarding what was required for salvation. By making circumcision a necessary requirement for one to be saved (See Acts 15:5ff. ), the Jews had attacked the Gospel of God's grace at its very core (see Gal. 5:1-12!). The faith of which Paul speaks, of course, is a living faith in Jesus Christ that produces, by God's Spirit, the good works that God wills be done in the Christian's life. That is why, immediately after his beautiful summary of the Gospel in Eph. 2:8-9, he continues, "For we are his workmanship, created in Christ Jesus for good works, which God prepared beforehand that we should walk in them." Of this living faith, Luther so eloquently said: "Oh faith is a living, busy, active, mighty thing, so that it is impossible for it not to be constantly doing what is good. Likewise, faith does not ask if good works are to be done, but before one can ask, faith has already done them and is constantly active" (Formula of Concord, SD, IV, 10-11). This is precisely what the entire book of James is all about. Genuine faith is a faith that shows itself in good works. Or as Luther again put it once, as an apple tree makes fruit and the fruit does not make an apple tree, so works do not make a Christian, but a Christian does good works. QUESTION: What does the LCMS believe regarding man's freedom of will? The scriptural doctrine of the freedom of the human will is closely connected with the doctrine of original sin (see Sin, Original). The doctrine of the freedom of the human will after the fall of man must be studied from the viewpoint of original sin. Scripture emphatically declares that man, also after the fall, continues to be a responsible moral agent, who in earthly matters, to some extent, may exercise freedom of will; but it asserts that "natural man receiveth not the things of the Spirit of God, ... neither can he know them" (1 Cor. 2:14); that man, by nature, is "dead in trespasses and sins" (Eph. 2:1); that "the carnal mind is enmity against God" (Rom. 8:7) and that no man can say that Jesus is the Lord, but by the Holy Ghost" (1 Cor. 12:3). Accordingly, Scripture denies to man after the fall and before conversion freedom of will in spiritual matters, and Scripture asserts that conversion is accomplished entirely through the Holy Ghost by the Gospel. God "hath saved us ... not according to our works, but according to His own purpose and grace" (2 Tim. 1:9); "Turn Thou me, and I shall be turned" (Jer. 31:18). It is also taught among us that man possesses some measure of freedom of the will which enables him to live an outwardly honorable life and to make choices among the things that reason comprehends. But without the grace, help, and activity of the Holy Spirit man is not capable of making himself acceptable to God, of fearing God and believing in God with his whole heart, or of expelling inborn evil lusts from his heart. This is accomplished by the Holy Spirit, who is given through the Word of God, for Paul says in 1 Cor. 2:14, "Natural man does not receive the gifts of the Spirit of God." Additional Scripture passages which may be helpful as you study and discuss this issue are: John 1:12-13; 15:16-19; Rom. 10:14-17; Eph. 1:4; 2:1-9; Col. 3:12; 2 Thess. 2:13. QUESTION: I understand that God chose those for salvation before the very foundation of the world. The Bible does not say that there are those who are chosen and that there are those who are not. So, does that mean God chose everyone to be saved before the foundation of the world and therefore it is man's choice whether he will accept God's saving grace? However, one cannot come into God's grace by himself, but by the Holy Spirit "leading" him unto salvation. Is that the correct interpretation? I am confused by the fact that we were chosen by God before the foundation of the world, yet the very action of choosing can mean there were those who were not chosen. I know God wishes everyone to be saved. Can you help me? ANSWER: The question you are wrestling with is really the question, "Why are some saved and not others?" Theologians throughout history have referred to this question as the "crux theologorum" ("the cross of the theologians") because of the difficulty (and from the Lutheran perspective, the impossibility) of giving an answer to this question which is satisfactory to our human reason. Some answer this question by pointing to man's "free will" — only those are saved who "choose" to be saved. Lutherans reject this answer as unscriptural because according to the Bible even man's will is "dead" and powerless to "choose" God and his grace in Christ. We are saved not because we "choose" to be saved but because the Holy Spirit works faith in our heart through the Gospel (even faith is a gift!). Others answer this question by pointing to God's sovereign will: God himself predestines from eternity some to be saved and others to be damned. Lutherans reject this answer as unscriptural because, according to the Bible, God sincerely desires all to be saved and has predestined no one to damnation. So how do Lutherans answer this question? The answer is that Lutherans do not try to answer it because (we believe) the Bible itself does not provide an answer to this question that is comprehensible to human reason. Lutherans affirm, with Scripture, that whoever is saved is saved by God's grace alone, a grace so sure that it excludes all human "action" and "choice" but rather rests on the foundation of God's action in Christ and his "choice" (predestination) from before the beginning of time. Lutherans also affirm, with Scripture, that those who are damned are damned not by God's "choice" but on account of their own human sin and rebellion and unbelief. From a human perspective, there is no "rational" or "logical" way to put these two truths together. Lutherans believe and confess them not because they are "rational" and "logical," but because this is what we find taught in Scripture. For a further discussion of this issue, you may want to read Of the Election of Grace in the Brief Statement of the LCMS, and/or Articles II and XI in the Formula of Concord (contained in the Book of Concord, the Lutheran Confessions). QUESTION: If I believe someone to be a believing Christian, can I ever criticize him for failing to do good works? Given that he is saved by faith, does God see to it that he will do good works, and, if so, does God fix the number and character of these works? Can a person with faith feel assured he is doing enough good works and that God is indifferent to further ones? Can a person who is not saved do good works? Is God indifferent to them? Or is He glad when an agnostic performs an act of Christ-like mercy? If a Christian knows he is saved by knowing that he has faith, should he bother with the question whether he is practicing Christ's teachings, given that faith alone is sufficient for salvation? Or should he bother with it only because a large enough absence of good works would suggest his faith might be too weak for salvation? ANSWER: You may criticize your Christian brother for failing to do good works insofar as God's Word criticizes him (faith without deeds is dead – James 2:14-26), but you must criticize yourself at the same time because no one is perfect, all have sinned. We need to be merciful and forgiving to one another. Also encourage one another to do good works (Heb. 10:24-25). Consider this Word to be the answer to your next two questions: "For we are God's workmanship, created in Christ Jesus to do good works, which God prepared in advance for us to do" (Eph. 2:10). The answer to the second part of this question is no, we cannot feel assured that we have done or are doing enough good works, since we do not know how many God has set for us to do. We don't know what God's plans are. If God has prepared in advance the works we are to do, He cannot be indifferent to any of our good works. Again, we need to encourage one another to do good works. All our good works are tainted with sin. "All our righteous acts are like filthy rags," as Isaiah reminds us. Therefore, they cannot be counted for our salvation. Only the perfect, all-sufficient righteousness Jesus accomplished for us with His perfect life will be enough for our salvation. This comes to us by grace, imputed to us through faith, faith being a gift of God (Eph. 2:8-9). God recognizes the Christ-like good works of the unbeliever as good in the sense that they are done according to the divine Law written in their hearts (Rom. 2:15). However, since they come from a wicked heart that is dead in trespasses and sins (Eph. 2:1), and not from faith, they are sin (Rom. 14:23) and in the spiritual sense displease God (Ps. 53:1-3). In the Kingdom of God's power, the civil righteousness — the good works of unbelievers — are good only outwardly. These are necessary for the welfare of human society, and God even rewards them with temporal blessings. But these good works of the unbelievers get them nowhere with God in His Kingdom of grace. Even works of civil righteousness will ultimately receive the condemnation of Jesus and will not prevent eternal punishment (Matt. 25:41-46). The Christian is not saved by KNOWING he has faith. By grace, God has given him faith in Jesus, and it is through that faith he is saved. For example, Abraham believed God (had faith, not just knew he had faith), and it was credited to him as righteousness (Rom. 4:3). Yes, the Christian should bother whether he is doing Christ's good works, even though he is saved by faith alone. It is God's will and express command that a Christian should do good works, which the Holy Spirit works in him. Christ's good works are indicators that a Christian has Christ's faith and not something else. Christ's good works will be the products of that faith, and those good works will be the public signs on which Christ will pronounce His public final judgment (Matthew 25). Faith, big or small, strong or weak, as long as it trusts in Jesus' merits, will SAVE. Saving faith is not contingent upon the amount of works one does, but is a gift of the Holy Spirit through the Gospel. Trust in Jesus above all for forgiveness and life eternal. Work while it is day before night comes when we cannot work, knowing God has given us a purpose and things to do for Him in this short life. QUESTION: Listening to a sermon on Sunday, the pastor was telling us we should lead good lives and try not to sin. But we do know God is all forgiving and that he died for all of our sins. To me, this sounds like double talk. On one hand we are not to sin, but on the other hand, we don't have to worry as long as we believe in our Lord Jesus Christ everything will be okay. I don't think our Lord came down and taught for three years on how to be holy and lead good lives and then die on the cross so that we can do what we want. Don't we have to ask for forgiveness, be truly sorry and really try to amend our life in order to be saved? ANSWER: It would be good for you to talk to the pastor to determine just what he said and meant. Sometimes we don’t hear correctly or catch the connection. So go to him and ask him to explain further. Scripture teaches us to repent of our sins — to be truly sorry for them and trust in Christ for forgiveness, every time we sin. At the same time, we sincerely and earnestly resolve, by the assistance of God the Holy Spirit, to henceforth amend our sinful lives. We do not play around with this. But repenting thus does not mean we will never sin again. When we sin again, we go again in repentance and faith and resolve, and God forgives again. As we trust in Jesus' merits, God forgives and saves us. In the end, it is unbelief — failure to trust in Jesus — that will condemn us to hell. Being saved does not depend on how hard we try to amend our sinful life, but as Paul said to the jailer in Philippi when he asked what he should do to be saved: "Believe in the Lord Jesus, and you will be saved — you and your household." Then, being forgiven in Christ, we will be compelled by God's love to leave our sins and live as God wants us to live. QUESTION: Can you lose your salvation, and, if you can, what do you need to do to regain it again? ANSWER: The Lutheran Church—Missouri Synod believes and teaches that it is possible for a true believer to fall from faith, as Scripture itself soberly and repeatedly warns us (1 Cor. 10:12; 1 Peter 5:8; 2 Peter 3:17; Heb. 2:1-3, 3:12-19, 6:4-8, etc.). Such warnings are intended for Christians who appear to be lacking a right understanding of the seriousness of their sin and of God's judgment against sin, and who, therefore, are in danger of developing a false and proud "security" based not on God's grace, but on their own works, self-righteousness, or freedom to "do as they please." By the same token, the LCMS affirms and treasures all of the wonderful passages in Scripture in which God promises He will never forsake those who trust in Christ Jesus alone for salvation (John 10:27-29; Rom. 8; Heb. 13:5-6, etc.). To those who are truly repentant and recognize their need for God's grace and forgiveness, such passages are powerful reminders of the true security that is ours through sincere and humble faith in Christ alone for our salvation. A person may be restored to faith in the same way he or she came to faith in the first place — by repenting of his or her sin and unbelief and trusting completely in the life, death and resurrection of Christ alone for forgiveness and salvation. Whenever a person does repent and believe, this always takes place by the grace of God alone and by the power of the Holy Spirit working through God's Word in a person's heart. QUESTION: Would you explain the LCMS position on "predestined" in Romans 8 and Ephesians 1? If one is predestined to be adopted as a redeemed child of God, then does it follow that another is predestined to not be adopted and therefore damned? ANSWER: The LCMS believes that Scripture clearly teaches (in passages such as those mentioned in your question) a predestination to salvation by God's grace in Jesus Christ alone. The LCMS does not believe that Scripture teaches a predestination to damnation; God desires all to be saved and to come to the knowledge of the truth (1 Tim. 2:3-4). Like so many teachings of Scripture (e.g., the Trinity, eternity, the two natures of Christ, the love of a holy God for rebellious sinners), this teaching seems contradictory and is incomprehensible to human reason. We believe it not because it "makes sense" to human reason, but because this is what we find taught in the pages of God's holy Word. For a helpful summary of the LCMS position on predestination, see the section on Of the Election of Grace in the Synod's Brief Statement (adopted in 1932). Who wrote the Common Table Prayer? Why is the word “descended” not in the Nicene Creed? Where in the Bible does it say Jesus descended into hell? Can you explain why Jesus had to descend into hell? Is Jesus God and God Jesus? To whom shall we pray? QUESTION: Who wrote the common table prayer used by many Lutherans, "Come, Lord Jesus ... ," and where did it come from? und segne, was du bescheret hast. And bless what you have bestowed. It is likely that the text has an earlier, possibly Lutheran, origin. In the 1753 hymnal it is placed not in the chapter containing “Old Moravian hymns” nor with the “18th-century Moravian hymns” but rather with “evangelical hymns from the 17th century” (“evangelische Lieder im siebzehnden Seculo”). More than one version of the second line of text is known among Lutherans in this country, including “Let these gifts to us be blest,” “Let Thy gifts to us be blest” and “Let these Thy gifts to us be blest,” as well as other variations. The same situation applies in Germany, where the line is variously said “und segne, was du bescheret hast,” “und segne, was du uns bescheret hast,” and “und segne, was du uns aus Gnaden bescheret hast” (“and bless what you have bestowed to us out of mercy”). Within our own LCMS tradition, this prayer appears in Evangelisch-Lutherisher Gebets-Schatz (St. Louis, 1881, 15th ed. ; originally published in St. Louis in 1864). This volume of Evangelical-Lutheran Prayer Treasures underwent numerous reprintings even as late as 1908. It attributes the authorship of "Komm, Herr Jesu!" to Martin Luther, although this is doubtful. 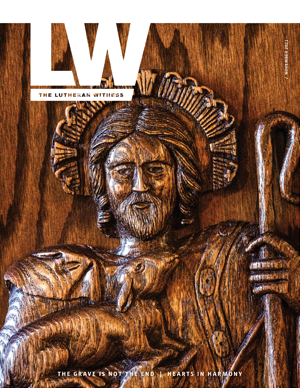 You may wish to read an article by David W. Loy titled, Come, Lord Jesus, that was published in the 2011 June/July edition of The Lutheran Witness. QUESTION: The Apostles' Creed and the Athanasian Creed contain the statement that Christ "... descended into hell." Why is this statement not included in the Nicene Creed? ANSWER: Back in 1960, Dr. Martin H. Scharlemann of our St. Louis seminary wrote an excellent article on the Descent into Hell, and in particular on 1 Peter 3:18-20, the key text for the teaching. I mention this article because in the introductory section of it, Dr. Scharlemann reviews history of its inclusion in the creeds of the church. He points out, first of all, that the article on the Descent was added to the Apostles' Creed at a rather late date and that it did not come into general use until the sixth century (much after the Nicene Creed, adopted in 325 A.D. at Nicea; although the date of the Athanasian Creed has been much discussed, there is some agreement that it dates from about 428 A.D.). The earliest reference to the Descent is found in a document dating A.D. 359. The remainder of the article then shows on the basis of 1 Peter 3 that the confession of Christ's descent is firmly rooted in this text of the Scriptures. QUESTION: In the Apostles' Creed, it says, Christ was "... crucified, died and was buried. He descended into hell. The third day he rose again ..." But in Luke, Jesus says to the thief next to him: "Surely today you will be with me in paradise." My question is, where in the Bible does it ever talk about Jesus descending into hell? ANSWER: Christ's descent into hell is described in 1 Peter 3:18-20. While this passage does not provide a great deal of detailed information about this event, it is clear that after Christ died he was "made alive in the spirit" and that in this state of exaltation he descended into hell—not to suffer, but to proclaim his victory over hell and the devil. The events of Easter (Christ's physical resurrection) then followed, and eventually (40 days later) his physical, visible ascension into heaven. QUESTION: I had been a Missouri Synod Lutheran for many years but never really understood a statement in the Apostles' Creed where it says that Jesus descended into hell. Could you explain this more fully to me? Did Jesus have to be tormented in hell as part of the payment for our sins, or was the finished work of Christ completed on the cross through his death and shed blood for the full payment for our sins? ANSWER: Lutherans believe Jesus descended into hell not to suffer for our sins but to proclaim his victory over sin, death, hell, and the devil (see 1 Peter 3:19). Thus, Lutheran theologians have always considered Jesus' descent into hell to be the first of Christ's works of "exaltation" mentioned in the Creed rather than part of his work of "humiliation." Christ's suffering for our sins ended with his death on the cross, and the final stage of his "humiliation" was his burial, not his descent into hell. QUESTION: Is it correct theology to say Jesus is God, or God is Jesus? Do these phrases diminish the Holiness of the Three in One? ANSWER: Significantly, the Athanasian Creed, which summarizes the doctrine of the Trinity as confessed by the church through the ages, begins by stating: "And the catholic faith is this, that we worship one God in three persons and three persons in one God, neither confusing the persons nor dividing the substance." It is clear from the Creed that to make statements such as "the Father is Jesus" or "the Holy Spirit is Jesus" is to confuse the persons of the Holy Trinity. At the same time, according to the Creed the three distinct persons of the Trinity are of one substance or essence. When the Scriptures speak of the three persons of the Trinity as God (the Father is God; the Son is God; the Spirit is God) they mean that each of the persons, though distinct, are of one divine essence: they are God. Specifically with respect to the Lord Jesus Christ, the Creed states of Him that He is God (and man): "God of the substance of the Father." This language is very carefully chosen here, so that — as the Creed states at the outset — neither the persons nor the substance are confused. As I know you agree, the Holy Trinity in Whom we believe is a profound mystery that is beyond human comprehension. This implies a twofold caution. On the one hand, we are bound only to what God has revealed about Himself in the Word, and thus we can say no more and no less than what the Scriptures teach. And on the other hand, we are unable on the basis of human reason to explain everything we may wish to know about this mystery. QUESTION: To whom should we pray? A fellow Christian recently explained that all prayers should be directed only to God the Father or the Trinity. She said that there are very few "ancient" prayers addressed to Jesus Christ and none to the Holy Spirit. I am having trouble with this. I believe that all three persons of the Trinity are present when I pray and all three hear and respond, no matter which Person I address. I have frequent prayers to Jesus. I ask the Holy Spirit's guidance in my faith life. When I pray, I pray to Jesus. And I can see nothing wrong in this. The Bible and the catechism have no restrictions. ANSWER: In answer to the question "To whom should we pray," Luther's Small Catechism with Explanation (Concordia Publishing House, 1986) clearly answers: "We should pray to the true God only, Father, Son and Holy Spirit." According to Scripture and the historic teaching of the Lutheran Church, Christians may offer their prayers to any or all of the three persons of the Trinity, each of whom is "true God." This is a clear and indisputable teaching of Scripture and of the Lutheran Church. Do we commune with the sacrificed or resurrected body and blood? Can a person use wheat and gluten free Communion wafers as an option? Are only LCMS members able to commune at an LCMS church? Who may take Communion to the sick and/or shut-ins? What does the LCMS teach regarding who may partake in Communion? What is the LCMS position on early Communion? Where in the Bible does it say Christ’s body and blood are present at Communion? Can I get sick from using the Common Cup? Could you please share the history of close[d] Communion? Could you explain the disposal of Communion elements? QUESTION: In Communion, do we commune with the sacrificed body and blood of Jesus, or do we commune with the resurrected body and blood of Jesus? ANSWER: The answer to your question is that we receive in, with, and under the bread and wine the true body and blood of Christ shed on the cross, Jesus Christ Who is now risen and ascended and sits at the right hand of God the Father. He is the same Christ, and when he gave us the Sacrament, as the Lutheran Confessions affirm, "he was speaking of his true, essential body, which he gave into death for us, and of his true, essential blood, which was poured out for us on the tree of the cross for the forgiveness of sins" (Formula of Concord, Solid Declaration VII, 49). In the Sacrament, our Confessions further teach the same Jesus who died is present in the Sacrament, although not in exactly the same way he was corporeally present when he walked bodily on earth. With Luther, the Formula of Concord speaks of "the incomprehensible, spiritual mode of presence according to which he neither occupies nor yields space but passes through everything created as he wills ... He employed this mode of presence when he left the closed grave and came through closed doors, in the bread and wine in the Supper ..." [FC SD VII, 100; emphasis added]. QUESTION: I have recently been diagnosed with Celiac Disease, which is an intolerance to gluten, a protein found in wheat, rye, barley and oats. If I consume even trace amounts of the aforementioned substances I become extremely ill.
What is the stance of the Lutheran Church—Missouri Synod on using wheat and gluten-free Communion wafers as an option for a person in my position? ANSWER: In the LCMS, we have generally commended the question of gluten-free wafers to the realm of individual pastoral judgment. In its 1983 report on Theology and Practice of the Lord's Supper, the Commission on Theology and Church Relations (CTCR) stated the following concerning the element of bread in the Sacrament: "Since the Scriptures are silent on the source of the bread, it may be baked from the flour of wheat, rye, barley, or other grains" (16; emphasis added). Similarly, Dr. C.F.W. Walther, in his Pastoral Theology, wrote concerning the kind of grain from which the flour for the bread has been prepared: "It is an adiaphoron whether the bread be leavened, whether it be rye, wheat, barley, or oats bread, and whether it have this or that form, so long only as it is baked of grain flour and water." Since rice is a grain, it would also seem consistent with this position that bread made from this grain would be permissible. Nothing here would preclude someone bringing bread to the pastor that is gluten free. However, Lutheran practice would require that the pastor consecrate this bread together with the elements being used in the Communion service. You are encouraged to discuss this with your pastor. The website celiac.com (under the question "Which Grains are safe, which are not?") notes that wheat, rye and barley must typically be avoided, but not necessarily oats, corn or rice. You should consult with your doctor as to whether oats, corn, or rice might be acceptable. The website glutenfree.com offers some crackers that might serve as acceptable substitutes. Gluten-free communion wafers also are available from Concordia Publishing House. QUESTION: Being raised in the LCMS, I was surprised today when I was visiting an LCMS church that had a pamphlet explaining their beliefs about Communion. It went on to say that if the visitor believed these things also then they could commune at that church. I thought only LCMS members could commune at LCMS churches. Has this changed? ANSWER: The Lutheran Church—Missouri Synod has never understood or applied the historic practice of close[d] Communion in such a way as to mean that only LCMS members are permitted to commune at LCMS altars. The official position of the Synod is that not only are members of other Lutheran churches with whom we are in altar and pulpit fellowship invited to commune with us, but also that in certain extraordinary cases of pastoral care and in emergencies members of churches not in fellowship with us may be given Communion. The Synod stated, for example, in 1986 "that pastors and congregations of The Lutheran Church—Missouri Synod continue to abide by the practice of close Communion, which includes the necessity of exercising responsible pastoral care in extraordinary situations and circumstances" (1986 Res. 3-08 "To Maintain Practice of Close Communion"). A number of resources are available and touch on this subject, including the Commission on Theology and Church Relation's (CTCR) 1983 and 1999 reports on Theology and Practice of the Lord's Supper and Admission to the Lord's Supper. QUESTION: Who may take communion to the sick of the congregation? Only the pastor? A lay leader? "7. May the elders take the consecrated elements to the sick and to shut-ins after the Communion service? 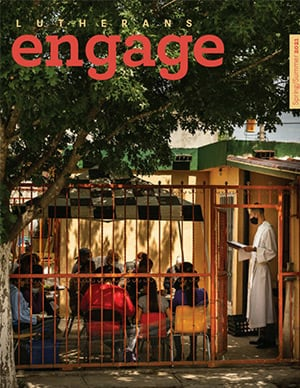 The chief consideration regarding such a practice is that the role of the pastor in the sacramental life of the church should not be displaced. The opportunity to conduct a brief service of confession and absolution, to involve other family members in the private Communion, and to be a shepherd for the flock suggests that whenever possible the pastor will distribute the elements to the communicants (cf. pp. 13-15)." QUESTION: What does the Missouri Synod teach regarding the sacrament of communion and who can partake in this sacrament? ANSWER: The LCMS believes Scripture teaches the Lord's Supper is a precious gift of God in which Christ gives us His true body and blood (in a miraculous way), together with the bread and wine, for the forgiveness of our sins and the strengthening of our faith. Because the Bible teaches that this Sacrament may also be spiritually harmful if misused, and that participation in the Lord's Supper is an act of confession of faith, the LCMS ordinarily communes only those who have been instructed in the teachings of our church and who have confessed their faith in these teachings. For more information, see the following links: Admission to the Lord's Supper, and Theology and Practice of the Lord's Supper. QUESTION: I understand many congregations are changing their Communion practice to include young children, and the Missouri Synod is also in favor of communing children, so we have been informed by our pastor. Is this true? ANSWER: In the 1960s the Synod participated in a pan-Lutheran study of confirmation and first Communion. The recommendation of this study was that it would be appropriate to commune children at the end of the fifth grade, prior to Confirmation. In response to this study, both the Commission on Theology and Church Relations and the Board for Parish Education submitted recommendations to the 1971 convention of the Synod.These recommendations conflicted with one another, the CTCR recommending that the Synod retain its traditional practice of communing children after they are confirmed, and the BPS recommending the adoption of the inter-Lutheran study proposal. The Synod itself adopted a resolution in 1971 that basically left up to individual congregations the decision as to what practice they may want to follow. Two studies done subsequently by a Board for Parish Services (now National Mission) staff member in the late 1980s indicated that less than 20 percent of LCMS congregations adopted the study proposal and that this percentage remained virtually unchanged for nearly two decades. We have no evidence that an increasing number of congregations have adopted, or are considering the adoption of, the practice of early Communion in recent years. QUESTION: What verses in Scripture can be cited that teach "that BOTH bread and wine AND Christ's true body and blood" are present in the Lord's Supper? ANSWER: All three accounts of the institution of the Lord's Supper in the Gospels (Matt. 26:26-29; Mark 14:22-25; Luke 22:14-23) explicitly state that Jesus took BREAD, blessed it, broke it, and gave it to his disciples saying, "Take, eat; this [i.e., this BREAD, which I have just blessed and broken and am now giving to you] is my body." Jesus uses similar language in referring to "the cup" (of wine) as "His blood." A plain and straightforward reading of these words leads to the conclusion that BOTH bread AND body, BOTH wine AND blood are present in the consecrated elements of the Lord's Supper. Paul clearly says here that we all "partake" of "BREAD" when we receive the Lord's Supper—even as we also partake of and "participate in" the true body of Christ. And he says we all "partake" of the wine (the cup), even as we also partake of the true blood of Christ. Similarly, in 1 Cor. 11:26, Paul says: "For as often as you eat this bread and drink the cup, you proclaim the Lord's death until he comes." Paul expressly states here that when we receive the Lord's Supper we are "eating bread" and "drinking the cup" (wine), but he goes on to say those who eat this bread and drink this cup are also partaking of the true body and blood of Christ. So "real" is this participation in Christ's body and blood, in fact, that (according to Paul) those who partake of the bread and wine "in an unworthy manner" are actually guilty of "profaning the body and blood of the Lord" (1 Cor. 11:27). (Partaking of the Lord's Supper "in a worthy manner," of course, is not something that we "do" or "accomplish" on the basis of our "personal holiness" or "good works." It means receiving God's free and gracious gifts of life and forgiveness offered in the Lord's Supper in true repentance produced by the work of the Spirit through God's Law and in true faith in Christ and His promises produced by God's Spirit through the Gospel). QUESTION: Wouldn't it be possible to contract a virus via an infected person who has drunk of the Communion cup prior to you? Drinking from the community cup seems to be the traditional and proper way. But does that potentially put me in harm's way? Does drinking from the individual cups remove some of the community aspect of the gift? Does it matter whether a congregation uses individual glasses or the common cup to distribute the consecrated wine? Studies have shown the risk of contracting illness or disease through the use of the common communion cup (properly wiped and handled) is quite small (though not, of course, non-existent). Those who are concerned about this possibility are certainly free to make use of the individual cup option, which is available in nearly all congregations today. QUESTION: Could you please provide the LCMS's stand on women serving Communion in worship service to assist the pastor? "The commission strongly recommends that to avoid confusion regarding the office of the public ministry and to avoid giving offense to the church, such assistance be limited to men" [1985 report on Women in the Church, 47]. While stopping short of saying on the basis of clear scriptural directions in this area "Thus saith the Lord," the Commission argues that the principal concern must be to preserve the uniqueness of the pastoral office as it relates to the role of women in the church. QUESTION: I am a member of an LCMS church, and I was wondering where I could get some information about why LCMS churches practice close[d] Communion so I could explain it to a friend who is Christian Reformed. ANSWER: We commend you for your integrity in representing properly the close[d] Communion policy that is followed by our church. Perhaps no other question has been given more attention in our Synod, especially in the last 25 years, than the question of Communion practice. You are probably aware it is the official practice of the LCMS to not extend an open invitation to the Lord's Supper to all who share our belief in the real presence of Christ's body and blood in the Sacrament. The Lutheran Church—Missouri Synod practices close[d] Communion for two main reasons. First, we are a close fellowship. We all believe and confess the same things, especially about Holy Communion. We express and celebrate that close[d] Communion with each other when we commune together. The second reason is more serious. Paul's words in 1 Corinthians 11:29 make it important for us to teach people about Holy Communion, or at least be sure they have been taught, before giving it to them. St. Paul wrote, "For anyone who eats and drinks without recognizing the body of the Lord eats and drinks judgment on himself." St. Paul gave instructions in this regard to the Christian congregation at Corinth (1 Cor. 11) regarding their responsibility to make certain people receive the Sacrament to the blessing and not to their harm. It would be very irresponsible to let anyone and everyone receive Communion when they may very well be eating and drinking judgment on themselves. So as you can see, Christians commune not only as individuals, but also as persons who share the same confession of faith as formally confessed in the host church. It is important to emphasize that God has given to Christian congregations the responsibility of administering the Lord's Supper properly and to exercise spiritual care toward all those who desire to commune. This, of course, means the congregation has a responsibility to do what it can in Christian love and concern to help people understand the nature of the Sacrament and why they come to it. Pastors and congregations of the Synod (regardless of the size or circumstances of the latter) are expected to honor and uphold the official position and practice of the Synod on "close[d] Communion," which includes the possibility and even necessity of communing non-LCMS individuals in special situations of pastoral care. At its 2007 convention the LCMS once again reaffirmed its official practice of close[d] Communion by adopting a resolution (Res. 3-09) in which it resolved "that all pastors and congregations who have established and practice Communion fellowship contrary to the Word of God and the Lutheran Confessions be encouraged by the 2007 LCMS convention to immediately cease such practice." Traditionally our Catechism has also set forth our church's position almost since its beginning. The theological rationale for the historic practice of close[d] Communion is presented in two CTCR reports: Theology and Practice of the Lord's Supper (1983) and Admission to the Lord's Supper: Basics of Biblical and Confessional Teaching (1999). I suggest looking at the answers given to a number of "Common Questions" (Section V) asked about admission to the Lord's Supper as they are presented in the Commission's report titled Admission to the Lord's Supper: Basics of Biblical and Confessional Teaching linked above. To become more familiar with the LCMS position, you may wish to read the FAQ on Communion Practice. QUESTION: Following a Communion service, what are the prescribed means for the disposal of the consecrated wine and wafers? ANSWER: To begin, care should be taken that inordinate amounts of bread and wine are not consecrated at each service, but rather just what is needed for that service. While Scripture does not tell us whether Christ’s body and blood are still present in the bread and wine after Communion, we should still treat what remains with greatest reverence. The point here is to recognize the fact that these elements were used in the service to deliver our Lord’s very body and blood to us. How we treat them after the service should never lose sight of that great mystery of faith. There are two places to find helpful information on this topic. One is Section B.2.c. of the Commission on Theology and Church Relations’ 1983 document titled, Theology and Practice of the Lord’s Supper. The consecrated elements which remain after all have communed should be treated with reverence. This reverence has been expressed by Lutherans in various ways. Some have followed the ancient practice of burning the bread and pouring the wine upon the earth. Others have established a basin and drain-piscina-specifically for disposal for the wine. The elders or altar guild may also return the consecrated bread and wine to specific containers for future sacramental use, or the elders and pastor can consume the remaining elements. All of these practices should be understood properly. The church is not, thereby, conferring upon the elements some abiding status apart from their use in the Lord’s Supper itself. “If any of the Lord’s body and blood remains, they can be disposed of in a number of ways. The best way is to consume the remaining elements, since the Lord said, “Take and eat ... Take and drink,” and did not provide for anything that was left over. There is historic precedent for reserving the remaining elements against the next communion. The hosts can be stored in a pyx or ciborium (apart from unconsecrated hosts), the blood of the Lord in a suitable cruet or flagon (apart from unconsecrated wine). What remains in the chalice, however, should either be consumer or poured into the piscine or onto the ground, since there may be crumbs or other foreign matter in it. The reserved elements may then be kept in the sacristy or placed on the altar or credence and covered with a white veil. It is un- Lutheran and irreverent to place unused elements in the trash or to pour the remainder of what is in the chalice or flagon into the common drain." As noted in the manual, the general practice of the Lutheran Church has been NOT to mix consecrated and unconsecrated elements. If the elements are saved for future use, it is best they are kept separate. The practice of consuming the remaining elements also has a long history in the Lutheran Church. Your congregation may want to consider purchasing The Altar Guild Manual as it covers a variety of altar guild functions that include displaying, cleaning and storing paraments and linens appropriately; caring for sacramental vessels and vestments; preparing for and cleaning up after worship services; ordering supplies and more. It is available from Concordia Publishing House by calling 800-325-3040 or by going to its website.